Editor’s Note: Anna Brower is a senior at Clearfield Area Junior-Senior High School, where she is a staff writer for the student newspaper, The Stampede. Contact her at thestampede@clearfield.org. 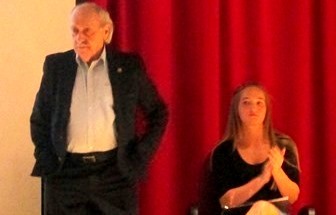 “I’m sitting here in front of you and I don’t believe it myself; I made it.” David Tuck, a survivor of the Auschwitz concentration camp, shared these words on April 20 with the students and staff of Clearfield Area Junior-Senior High School during two assemblies held at the school. This special guest was brought to the school by freshman Erica Hanes. For her freshman I-Search project about the Holocaust, Erica’s mother contacted the Holocaust Awareness Museum in Philadelphia to retrieve materials for Erica’s research. Soon, she was put in contact with Tuck. The student project evolved into a visit to the school, where Tuck shared his own story about surviving Auschwitz and the Holocaust with students in seventh through twelfth grades. Tuck was born in Poland and shortly after his birth his mother passed away. He was raised by his Orthodox Jewish grandparents. On Sept. 1, 1939, things began to change as Germany invaded Poland. By that winter he and his family were sent to Lodz ghetto and then in 1941, Tuck was sent to Posen labor camp in Poland. Two years later, he was sent to Auschwitz to work as a mechanic. The camp was liberated by Americans on May 5, 1945 and in 1950, Tuck immigrated to the United States. Tuck began speaking to audiences when his daughter was in high school and he heard that people were denying the Holocaust ever happened. “I’m happy I’m alive; it is the most important thing,” Tuck said while speaking to Barb Simpson’s advanced German classes at the school. To view a live stream video of Tuck’s presentation, go to www.livestream.com/clearfield.